I'm the Director of Business and Strategy at an international brand consultancy. Last month, I made the move from Singapore, to a country that holds a lot of personal significance to me: Vietnam. Before Singapore, I was working in New York. I've also briefly lived in London and Istanbul, so international travel is my bread and butter. Last year I averaged about 1.3 flights per week; this year before moving to Saigon, it took a concentrated effort to reduce it to 1.2 flights per week. The past couple of years have seen many backpacking breaks, business trips, and weekend holidays. From hostels to crashing with friends to Airbnbs to five-star hotels, my travel experiences run the gamut. Given how high-maintenance people think I am (I'm almost always wearing a dress and I don't remember the last time my nails were naked), most would be surprised by how little I pack. Whether my trips last 2 days or 6 weeks, the size of my bag rarely changes. One of the most unique places I've visited is Cabo Polonio. It's a tiny, hippie beach town on the eastern coast of Uruguay, so small that they don't even have roads or addresses. Everything runs on solar energy, so at night, the place is illuminated by candlelight and most hostels and hotels will only have wifi turned on for an hour per day. Everyone there was so chill and trusting; I would find iPhones just laying about. For the few days I was there, I would spend my mornings buying bread from the local baker, my afternoons in the ocean, my evenings cooking by the fire pit, and my nights falling asleep outside in a hammock after long conversations with my hostel-mates. As someone who thrives on the fast pace of city life, Cabo Polonio truly offered me a vacation from being myself. Turkish Towel: These cotton towels are so much less space-consuming than your regular terrycloth bath towel, surprisingly absorbent, and incredibly quick to dry. Also they look cute enough to be worn as a scarf, so during travel days you don't even have to pack it in your bag, saving you precious space. The quality of your towel does matter, so don't try to skimp here! You want to get one that feels very soft and not stiff. I bought mine for about $25 USD from Kılıç Ali Paşa Hamamı's boutique in Istanbul and it's the same one they use in their hamam. 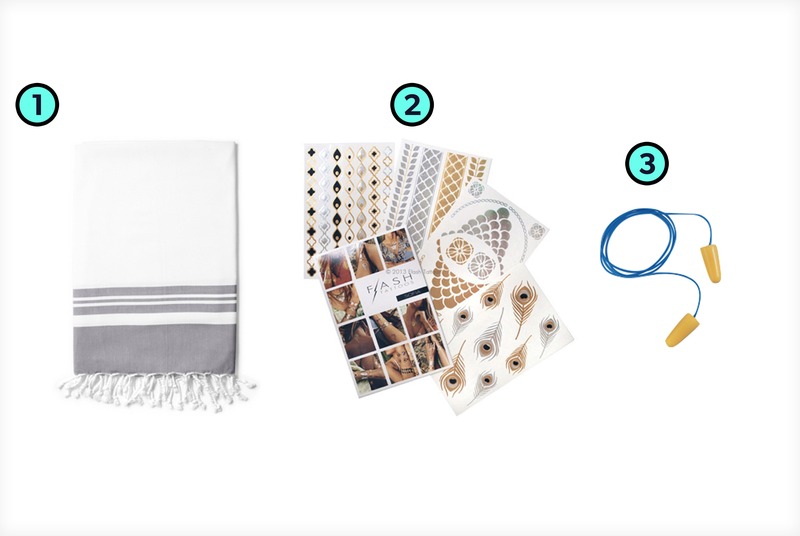 Flash Tattoos: Any time I know I'm going on a vacation where I may show some skin (like at the beach or pool), I bring along my Flash Tattoos. They're great to share when making new friends and they take up no space at all in your bag. Because of my Flash Tattoos, in Argentina they were calling me “linda” like it was my first name (sorry couldn't resist, I'd been saving that line in case I ever wanted to write a braggadocio rap). Howard Leight Max Lite Corded Earplugs: Each one of my travel bags and suitcases has a pair of ear plugs packed inside them so I never forget to carry some along. Whether it's a noisy train, a snoring hostel-mate, or in my case, a rumbly tummy, ear plugs and an eye mask will block out all surrounding environments and turn any place into my bedroom. One way I keep my outfits fresh for travel photos, is that I bring clothes I'm ready to part with, especially trekking clothes. After I was done with the Amazon rainforest, I threw away a couple of outfits, allowing me to pick up some unique items from the boutiques in Buenos Aires. Even though I grew up in Texas, in some ways, I am still very Vietnamese. I like to carry around a small bottle of Eagle Brand Medicated Oil and a large coin (size of a quarter or larger). If I end up catching a cold while traveling, I will find someone to “cạo gió” for me. This literally translates to “scrape wind” and consists of lubricating my back with Eagle Brand Medicated Oil and then applying repeated pressured strokes with the edge of the coin to the point of light bruising. Please do not look up pictures of the process; they are disturbing and I swear the practice is nowhere near as painful as it looks. Have a bag with all your little travel toiletries and an extra toothbrush and contact lens case so before a trip, you just need to throw that into your travel bag versus scrambling around your bathroom the morning of. Similar to the earplugs and eye mask, keep a bag for your dirty clothes in all the bags/suitcases you travel with so you don't forget it. Don't pack things that you *may* use. If you'll so desperately need it in the future; chances are the people in whatever country you're visiting have had and have developed a solution for that need. Avoid packing alternate shoes or jeans. They are some of the most space-consuming items and all jeans pretty much look the same. If going somewhere cold, don't pack too many outfits, just stick to a variety of scarves since no one will be able to see what's underneath your coat in photos anyways. On travel days, wear all your heaviest and most voluminous items to maximize space in your bag and avoid overweight fees from budget airlines. Speaking of budget airlines, for the ones that only allow one carry-on item, pack a day bag, one small enough to hide underneath your coat or in the space between your back and backpack if you need extra space. Pack a small, flat mirror in your make-up bag and learn how to apply eyeliner with one hand since not all hostels will have your mirror needs covered. Use a packing list app to quickly confirm you haven't forgotten anything. I like PackPoint. (download PackPoint for iOS | Download PackPoint for Android).